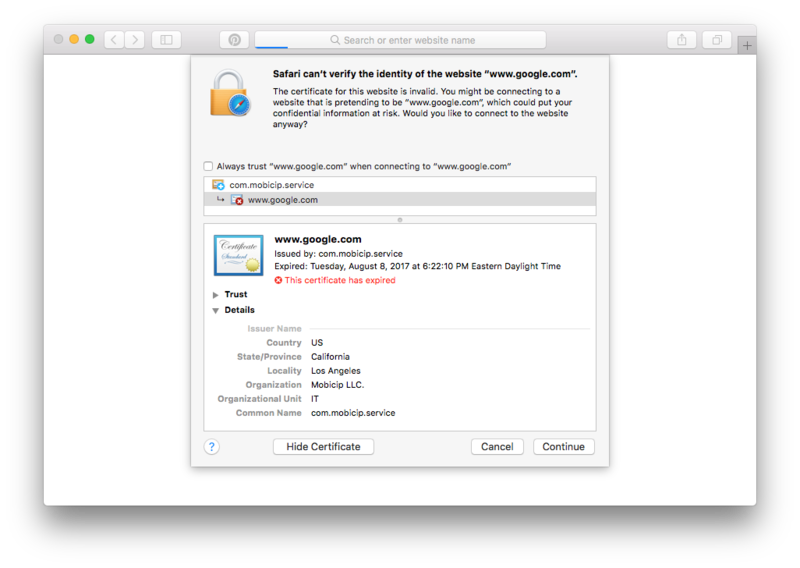 I'm having issues browsing a lot of websites including Twitter, Facebook, and Google.com because of expired certificates issued by Mobicip. This is using Safari with Mobicip for Mac. Is this an issue on your end or mine? This has been happening for several days. It has caused me to be unable to check email and perform my work. I need this fixed ASAP. We suggest you update Mobicip on the device to our latest version and check if the issue is resolved. Top download/install the latest version, click Mobicip notifier -> click check now/ update now button-> Installer pops-up, proceed to install like initial installation. I'm still have this issue and it's been almost three weeks. Now certain websites such as GMail and Facebook won't load at all because of the expired certificates coming from your server. I'm on the latest version, Version 1.0 (73) and am a premium user. This is getting tiresome and infuriating. I'm having the same issue. Expired certifcates from Mobicip on normal sites like Gmail.com, Facebook, Google.com, etc. Mobicip software is up to date and synced. Computer has been restarting. Macbook Pro using Safari. Thanks. It has been happening since 8/25/2017. That seems to be when the certificates issued rom Mobicip expired. We need more info like system type/version for further investigation. If required, we can even scheduled a Remote Control session to check the issue. So, please send an email to our Email Support via your registered email id and we will guide you further accordingly.